We have stay with you on many occasions and will continue to do so. I like the fact that check in etc is so simple, good location although the area is a little dodgy at times, price is right and rooms are clean and tidy and quiet, for me the perfect place to stay when in Melbourne. It was a friendly and easy service and comfortable room. We do apologise for any inconvenience. Each apartment has its own instantaneous hot water unit and should not run out, however i will definately investigate further as to why the hot water did run out. Loved the place. Very quiet and quaint. Easy to get to the metro and have to love the St. Kilda area. Very much enjoyed our stay. Very happy with the location and the accommodation. 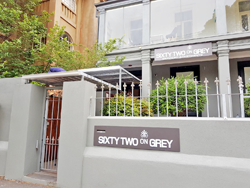 Travelling alone I found 62 on Grey suited me perfectly.The Staff were very friendly & helpful.The room was very comfortable & the location excellent.I am looking forward to staying there again soon with my husband. A little bit rough in the area now but the units were fine. Very convenient location. Pretty good check in routine. Appreciate the late check out. Maybe make it easier to get in from back patio in #9. Prior to arrivival we referred our concerns to staff in respect of room quietness and car parking arrangements. Advice received on the two issues was 100% accurate and to our total satisfaction. Permit parking in nearby streets was convenient and readily available during our stay. The only issue experienced was no immediate assistance available to rectify incorrect security code access on front security gate. It took a couple of phone calls and a delay in the cold to have this rectified, but when entry was gained we very much appreciated the room heater being turned on to provide a warm welcome. Overall a most enjoyable and comfortable stay and we would happily stay at or recommend 62 on Grey apartments again in the future. Aside from a brief issue when I first arrived (keys not available & code didn't work), the stay was lovely. The issues at the beginning of the stay were dealt with quickly and politely. Too easy. Very happy customers. Thank you. Friendly and nice staff, trouble free from the moment that I booked until the end. Really appreciate let us to storage our bags in the beginning and late check out in the end of our trip. apartments is close to pretty much everything and only 10 min from town, exactly what we want, Very good value for money, room was clean it when serviced was perfect. Great location and a lovely clean, quiet room. I was very pleased. We had an enjoyable and comfortable stay in your apartment. It was perfect for location. We had had one bad night where the residence above our apartment were very loud and sounded like herd of elephants until the early hours. But the rest of our stay was great and we would stay again. We found 62 On Grey perfect for our needs. The only reason our ratings regarding staff are not higher is that we did not really have direct contact with staff. The accommodation was spacious and comfortable and everything functioned well. Our friend who occupied the apartment next to us concurs with our assessment of 62 On Grey. We would certainly consider another stay, especially at the competitive price at which we attained our accommodation. our second time staying in 62 grey street, loves the location nearby cafes, supermarket and the beach. Room is well stocked and clean. request of additional items were met. only con is that the wall is pretty thin and can hear the slamming of door from next door everytime sometime enter or exit the door. Sixty Two On Grey was exactly what I needed. Easy self check-in/out system. It was a clean and decent sized apartment. The service received when booking and altering my booking was excellent. Apologies for the room not being serviced, it was scheduled for a service on the third day however i will follow up with my staff. Very happy with our stay, the property, cleanliness and servicing of room was excellent and unexpected. We will have great memories of our trip. Cheers. Great internet-- lovely apartments Parking the only issue! This was our first stay at your property. Having booked on the web, we were very pleasantly surprised when we arrived how spacious and well set up the apartment was. It was perfect for our needs for a weekend visit to Melbourne. A beautiful, cosy place to stay - one I will recommend to all my friends and family. Great place, lots of room, close to shops and plenty of places to eat and close to the beach. We had a lovely stay thankyou very much! Very simple, inexpensive, everything you will need, great for a longer-stay.